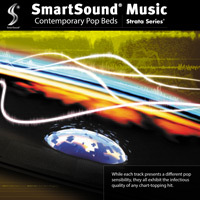 Inspired by the latest pop hits, this album was specifically produced to provide very contemporary sounding backgrounds for film, television and advertising projects. While each track presents a different pop sensibility, they all exhibit the infectious quality of any chart-topping hit. Even though they were designed as background tracks, our Mood Mapping feature can easily adjust any featured part so they slide underneath dialogue scenes in a snap. And, our Custom Length feature will perfectly fill each track to the exact time of the scene.